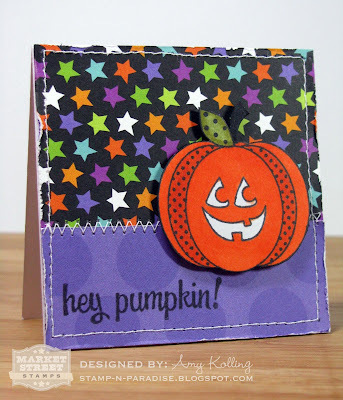 It's Day 3 of the newest Market Street Stamps new release! Today's post of mine is going to be a work in progress. I have wanted to combine my favorite recipes and make a mini book of sorts using them. 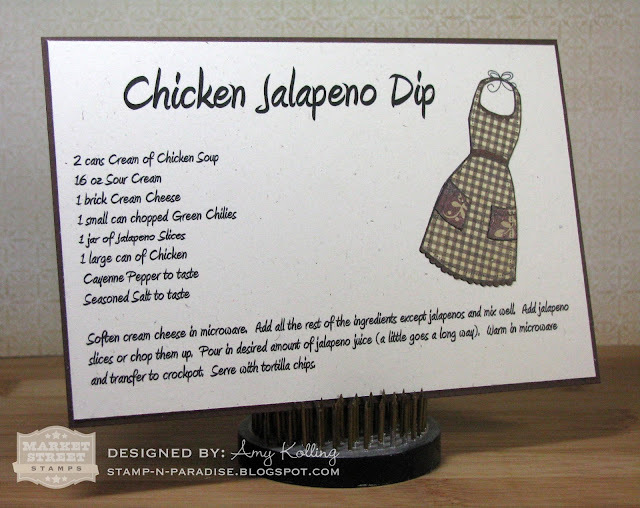 So I start today with a recipe for Chicken Jalapeno Dip. Oh my. I've made this 2 times in the past few weeks for parties and I had people asking for the recipe. I do want to give credit though........this recipe came from a co-worker of my husbands so I have her to thank because it is soo yummy! I do tweak the recipe and add more or less of some things! That being said, today's recipe card is embellished with a paper pieced apron from the newest Market Street Stamps set: Comfort Food. I thought this pattern paper from Simple Stories by Generations was perfect to paper piece this adorable apron image. This stamp has so many little details! My recipe was printed out on my computer using a standard font. This stamp set has so many possibilities and can't wait to use it more!!! 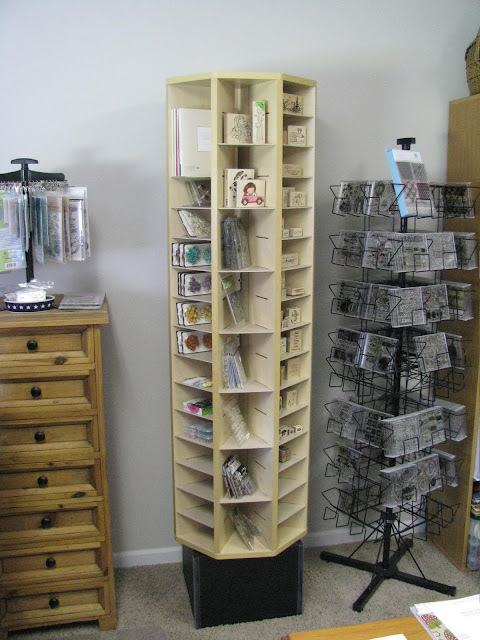 Make sure to check out the newest inspiration from the rest of the DT over at Market Street Stamps!! Remember all sets you've seen this week are on sale! For ONE WHOLE WEEK, new sets are 15% off individually or 25% off if you buy that month's bundle (all sets in the release)! Are you ready for another peek at what's in store for this month's Market Street Stamps release? I mentioned yesterday that I might have a peek at a stamp that may become a staple in your collection. This month we are introducing the background: Argyle. LOVE this stamp. Fabulous. No lining up needed. Just ink and stamp! I've stamped my Argyle pattern in Fresh Snow ink on a Kraft cardstock. My little sentiment is 2 stamps from the Simple Joys set by Market Street Stamps. Hi everyone! Alright, a little business. First, I fully intend to get back into the swing of things this week. Some of you know that I had a very dear high school friend pass away last week and let's just say it took a toll on me. He was 37. My age. It hit home and I had to reevaluate where some things set in my life. So my little blog became less chatty and more business. I also know that I have sadly neglected my friends blogs and seeing their wonderful creations. I promise to get by and see them this week! Ok, now for what you are here for. Market Street Stamps new release time! This is such a fun time of the month. 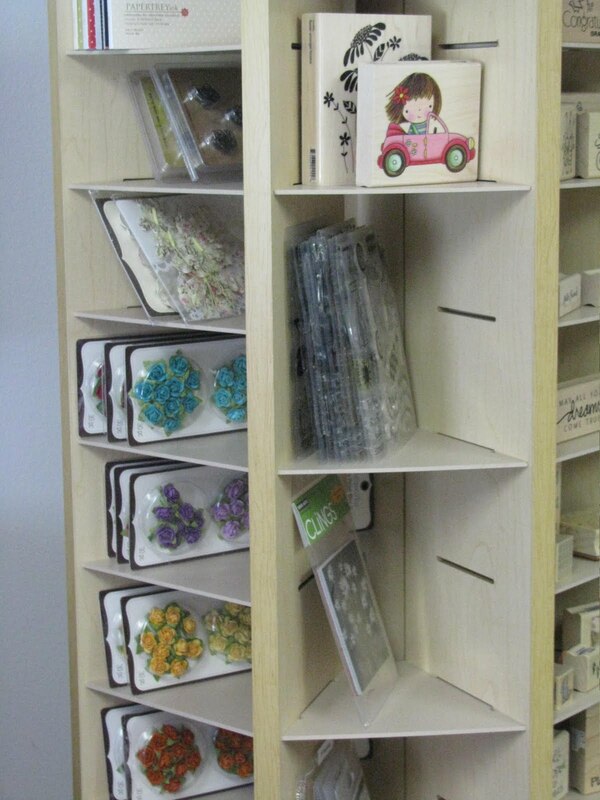 A time where we show off the new goodies designed by Angelica. These releases just keep getting better! 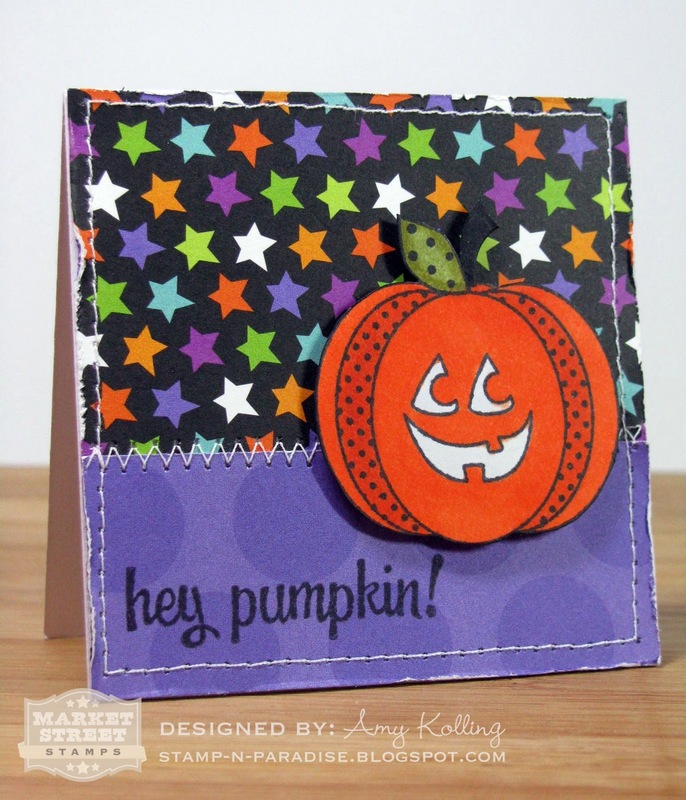 I have a cute little card for you today using the Happy Pumpkin mini set. For every major holiday, I make my kids little cards to tuck into their decorated mailboxes. I got a head start here with Halloween this year. My card measures 3 x 3 and uses some Doodlebug Design paper. My cute little pumpkin was colored with Copics (YR68, YR18, C1, YG93, YG95, 110), cut out, and popped up for some dimension over my white zigzag stitched line. I roughed up the edges of the papers with my fingernail.......easy peasy! This sentiment is 1 of 2 that are included in this mini set! 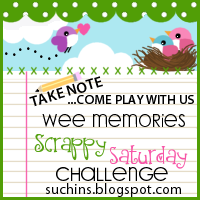 Very quick post today.........Here with Wee Memories Scrappy Saturday Challenge sponsored by the fabulous Echo Park company! So you guessed it..........the challenge is to use Pattern Paper on your cards this week! Let's see what you've got! I've used papers from A Walk in the Park by Echo Park for my colorful card today. 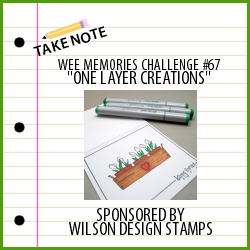 Make sure to check the Wee Memories blog for more inspiration using Pattern Paper! 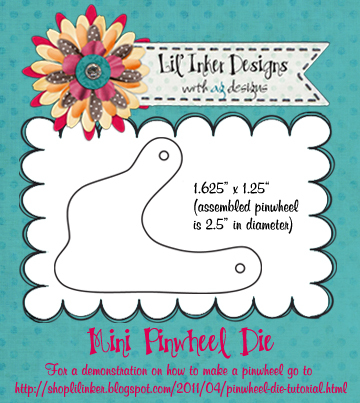 **Please click HERE for my Lil' Inker Designs Release Day #5 post!!! Hi everyone! It's my post day over at Market Street Stamps and I'm here today with a fun, bright Birthday card using the flowers from the Comforting Florals stamp set. I love to use a stamp set for things other than what it was made for. This set is one of those! Here the newest background, Cane, was embossed with clear embossing powder for a little added shine on the pink cardstock. Since Comforting Florals is a sympathy set, I needed to search for a sentiment and I found it in the Celebrate Cake stamp set!! 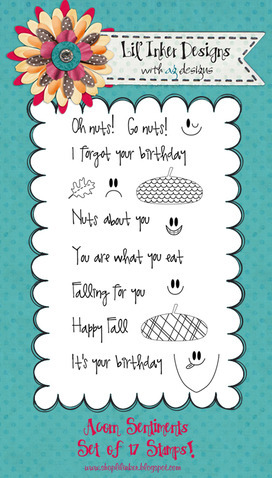 You can also see a peek of another sentiment from Celebrate Cake on the inside. My flowers were colored in with Copic RV25/R59 and the vase with BG10/BG13. Thanks for stopping and have a great start to the weekend! 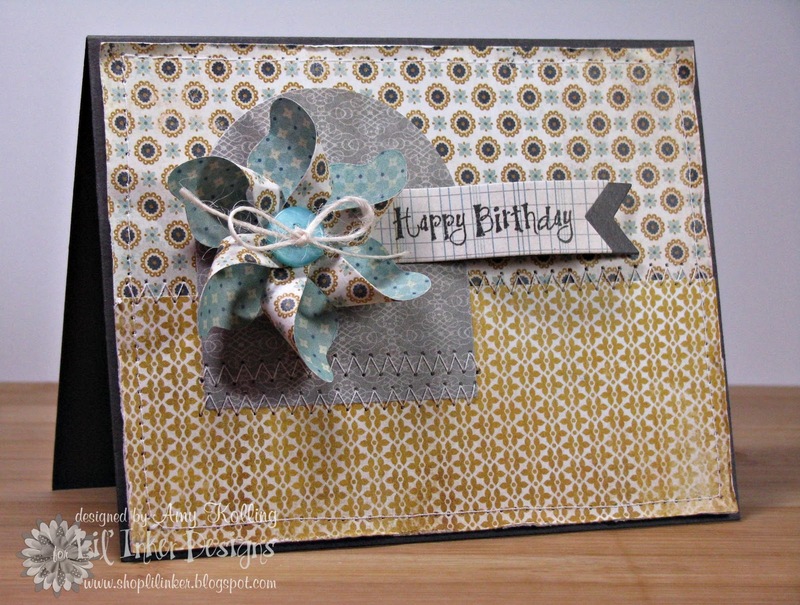 This is the day you've been waiting for........the last day of the Lil' Inker Designs blog hop! 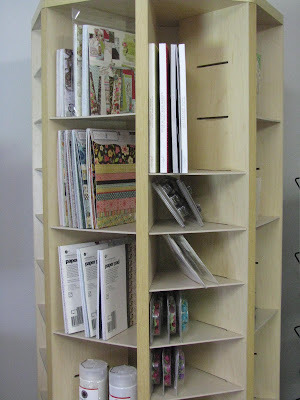 Today is the group post day where you will see TONS of ideas for the next die in the LID lineup. You should have arrived from one of my best friends, Jen's blog. So have some of you already guessed it? Laura gave a pretty good hint the other day. Let's introduce the Acorn Die and Stamp Set! I have to say that this die is so stinkin' cute........it has the dashed lines that I LOVE from the Lil' Inker Designs Cloud dies! I know I rave a lot about different fonts but this font is just so whimsical and fun! Sometimes I like or dislike a stanp set JUST because of the font............well, I LOVE this font! It is a perfect choice for this set!! Hi friends! 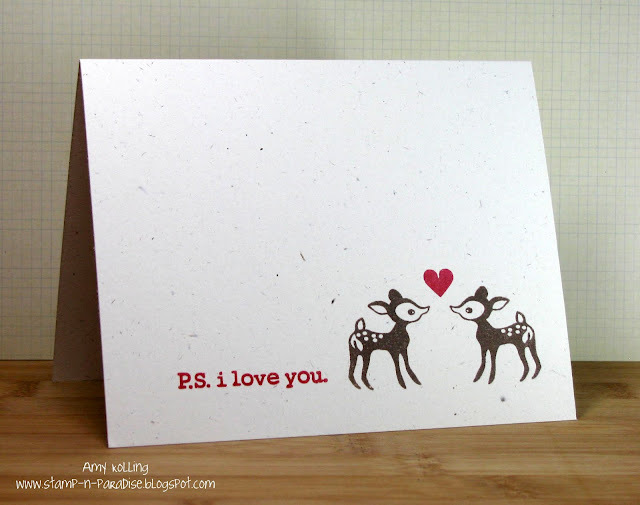 Let me just ask, are you enjoying the LIL' INKER DESIGNS release week blog hop yet?? I tell you, I have been blown away by the talent of my fellow DT members this week. 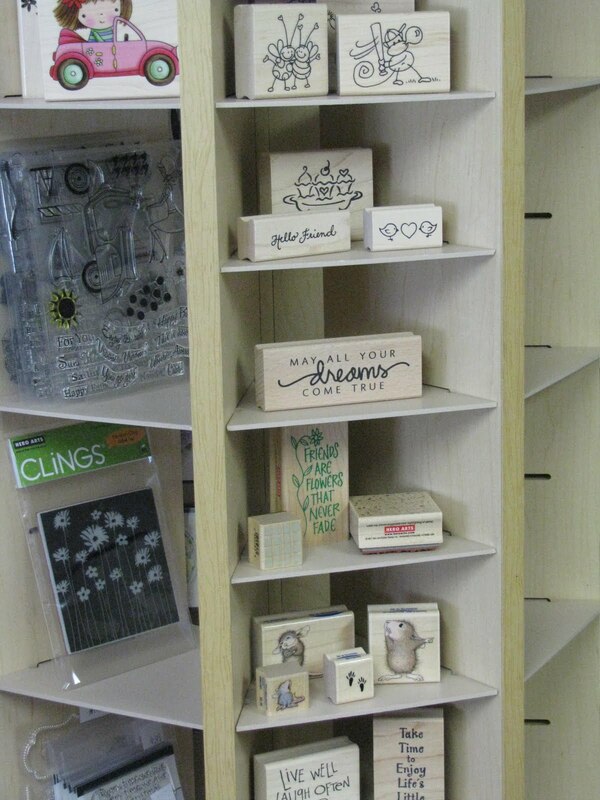 Every day there are fresh new ideas for these awesome Lil' Inker Designs products! You should have found your way here from Emily's blog. 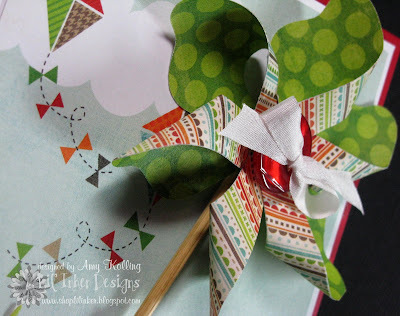 If you stopped by the Lil' Inker Blog yesterday, you would know the next product we are showing is the Mini Pinwheel Die! If you liked the other pinwheel from Laura, you will LOVE this mini version!! This one is the PERFECT size for cards! I had given you a sneak peek of some leaves I created with the new mini pinwheel die on Monday with my Fringe Flower card. 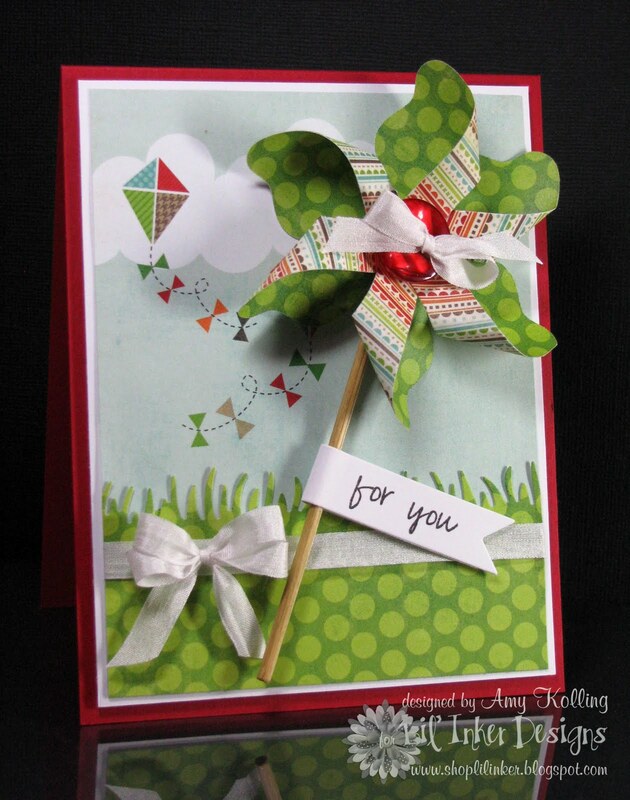 Here it is in its pinwheel form on a card. Just the sweetest thing! Now for a very exciting announcement regarding Pinwheels that you'll SPIN for........we've made ALL of our Pinwheel products: the Original Die, the Mini Die and the coordinating stamp set available individually for purchase!!! 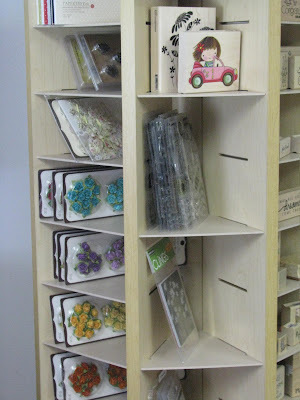 Now you can grab those extra Original Dies you've been wanting AND our new Minis! The Mini Pinwheel die retails for only $5.00 plus applicable shipping and handling. 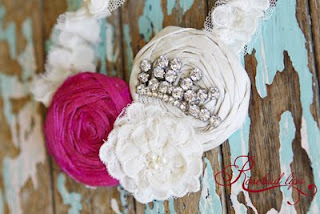 Again today, the next stop on the Blog Hop is my very good friend, Jen. Go check our her awesomness today.......she is a genius when it comes to ideas!!! 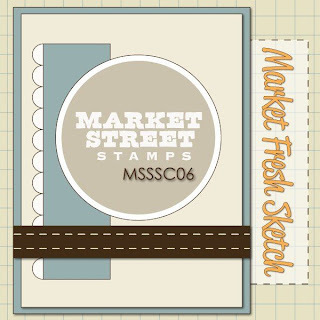 Market Street Stamps: Sketch Time! Are you ready for another great sketch from Market Street Stamps? Check out the sketch this time around! I had a little fun with my Copics and Distress Inks here (again)! I don't know what's getting into me.......I've been using a lot of Pure Poppy color lately but I like it! I've used the large bird from Follow Your Heart as my focal point on the circle from the sketch. I love how it turned out! The vertical grid panel is stamped with Pretty Perfect Grid BG.....Have I told ya yet just how much I LOVE these BG stamps?? hehe Absolutely love the fact that there is NO lining up of stamp strips. Check out the rest of the DT sketch samples and I can't wait to see your creations over at the MSS Sketch Challenge! Laura and Ariana have brought us some new goodies for the September release! 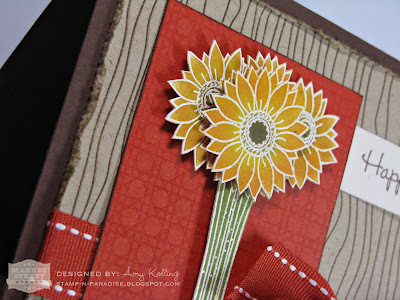 Today I'm very excited to show you the newest Die from Lil' Inker Designs! Are you ready? 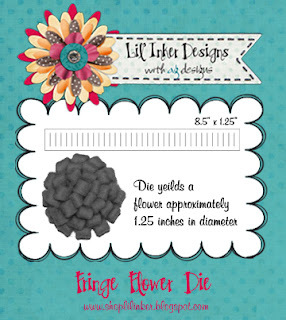 It's the Fringe Flower Die! Goodness, it is a ton of fun to play with! Since this is our monthly New Release Blog Hop, you should have arrived from Alicia's blog. Next blog to check out is Jen. I personally can't wait to see what she's done with this!! Don't forget that every day this week there are DT members participating in the Blog Hop........Wednesday we bring you another new product! I'm here with a new challenge for Wee Memories! This one uses NO pattern papers......none what so ever! So just some good ole' stamping my friends! Yes, you can create your own pattern paper with stamps but no pre-printed papers. I had to ink up my new Wplus9 stamp set: A Pocketful. This is my very first Wplus9 stamp set. This is such a cute set and will definitely get some use here at my house for the kiddos! However, today I just made a simple 'Thanks' card for my stash. For this week's sponsor and prize, please check out the Wee Memories blog for details! Can it get any better than that? It even swivels and has soo many little cubbies to hold stuff! 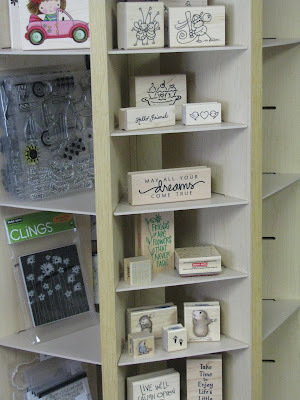 Here are my wooden stamps. Here is my stash of 6 x 6 pattern paper pads. Unfortunately, the PTI ones don't fit as they are 8 x 8 unless you take out a shelf and I just don't want to take out any more. Here are my finished cards.........just one of the many places I keep them until I get them ready to sell. As you can see, I still have soo much more space for later!! 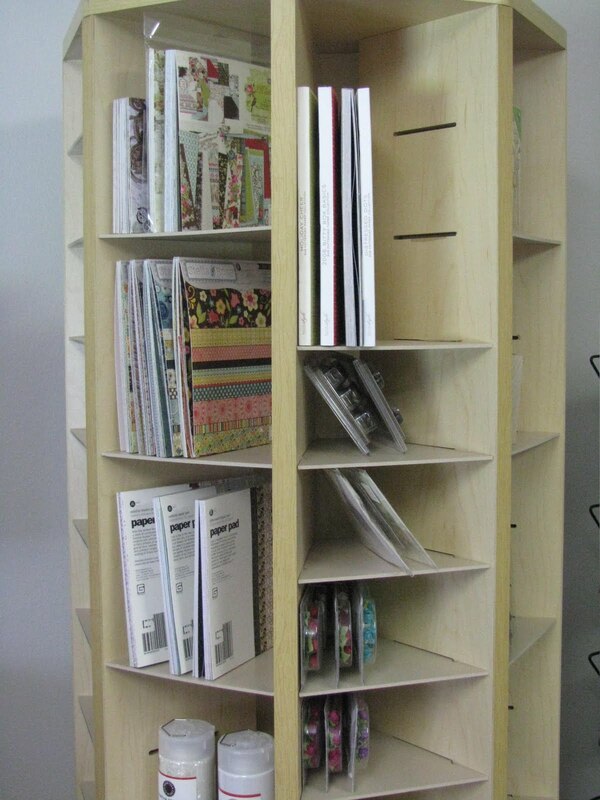 So you never know where a storage idea for your crafty area might just show up! The wire rack in the top photo was an awesome buy at my local Goodwill store.......gosh I think I paid $5. It holds ALL my PTI stamp sets! That's it for today but I'll be back tomorrow with the next Wee Memories challenge! It's Wee Memories Challenge time again! This week brings us a card that I can say I almost NEVER make: CAS one layer. Yes, I said ONE LAYER. Do you know how hard this challenge was for me? Me who likes to add layers, buttons, ribbon, twine, etc??? It was HARD but hey that's what a challenge is right?? I just so happen to have this cute little set of stamps called Gnomebody like You from Wilson Designs. This week's sponsor just so happens to be Wilson Designs! This sponsor is a bit dear to my heart as designing for Wilson Designs was my first DT experience. Kim gave me a wonderful opportunity and it was a blast. Go check out her website for all the cuteness......you may not be able to stand it! Thanks Kim for being the sponsor this week for Wee Memories. Like I said, I don't usually make cards like this but it turned out pretty cute. I paired the 2 deer images from Gnomebody like You with the tiny heart and sentiment from Love Songs (Papertrey Ink). The only thing was making sure everything was lined up correct! That was hard. I'd love to hear what you think. I wanted to share a card I made using the Lil' Inker Designs Pinwheel Die. 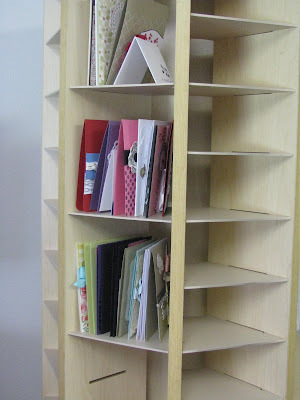 It is super super easy to assemble and Laura has even made a tutorial on how to do it! Let me just say that when I received this die, I thought I knew how to assemble it. Yeah right! The HARD way. Go check out her tutorial HERE......much simpler I tell ya! Thanks Laura! 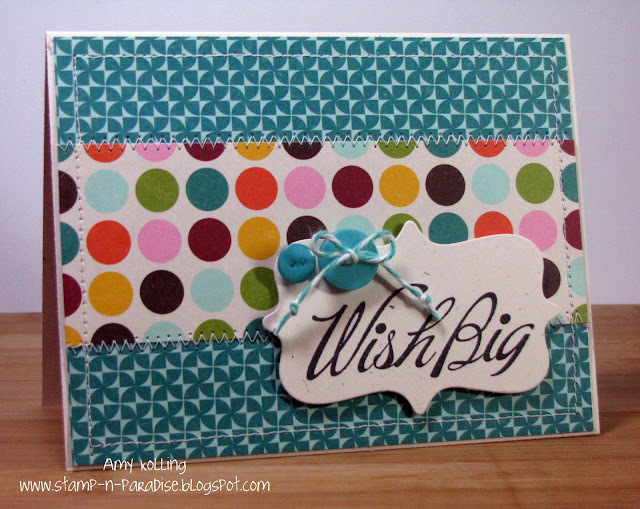 The only stamping here is for my sentiment and it was stamped on the Lil' Inker Designs Sentiment Flag Die. My colorful pattern papers are from the Lime Twist: Fly a Kite by MME. I am getting pretty excited as Laura is releasing some *NEW* things coming soon!!! That's all I can say at this point but you can bet they are going to be awesome!!! Have a great Friday! 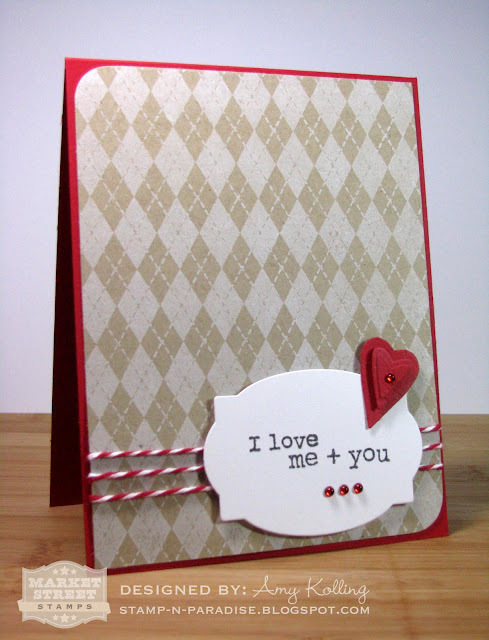 A quick post here to show you my card for the Paper Smooches Sparks Challenge. I've had this challenge on my list of to-dos and finally had time to get it done today! It gave me a chance to ink up my Paper Smooches Word Up stamp set and make some of those yummy rolled ribbon flowers! Hi everyone! 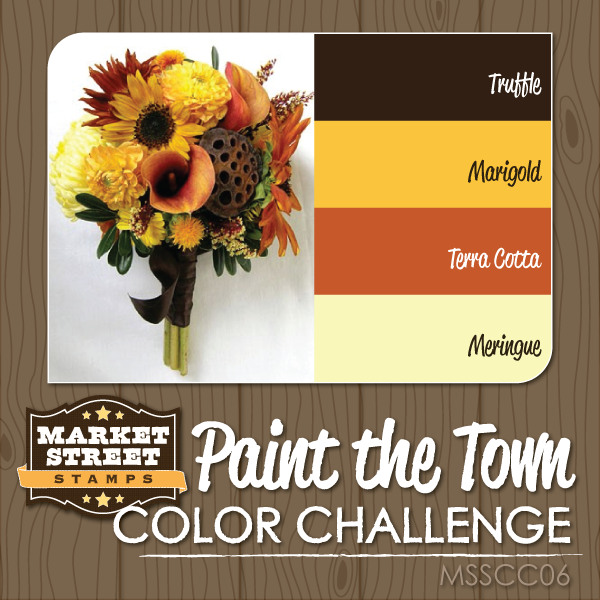 I'm here with my card for the previously named Color Cue Challenge for Market Street Stamps. It has been renamed: Paint the Town. Just look at those yummy fall colors! I took so many things from the colors to the inspiration photo for my card today. 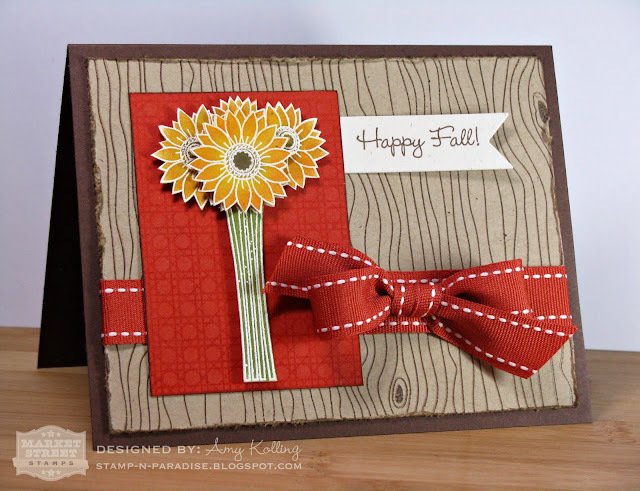 I used one of the newest stamp sets just released last week called Autumn Greetings. I LOVE this set......such a fabulous fall set. It can be sophisticated or whimsy. Are you getting tired of me using Distress Inks yet? I hope not.....because I'm having a ball using them. Totally takes the guess work out of blending/shading! For my edges.....I pulled out an oldie but goodie tool: the Heidi Swapp Edge Distresser! Here is a closeup of the dimension with the flowers. 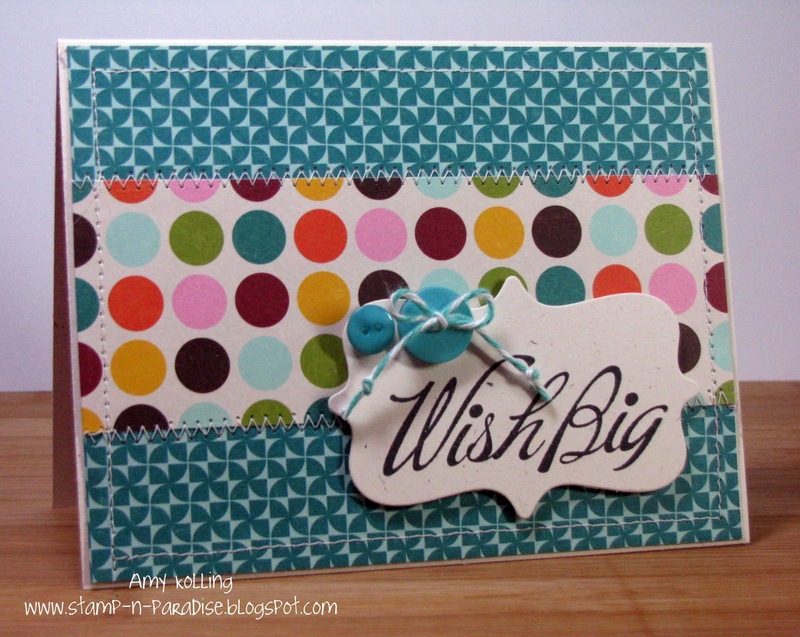 Thanks soo much for visiting and don't forget to check out the Market Street Stamps Blog for the rest of the DT samples! !